Now that we’ve learned how to make pomegranate molasses, we need to use it! 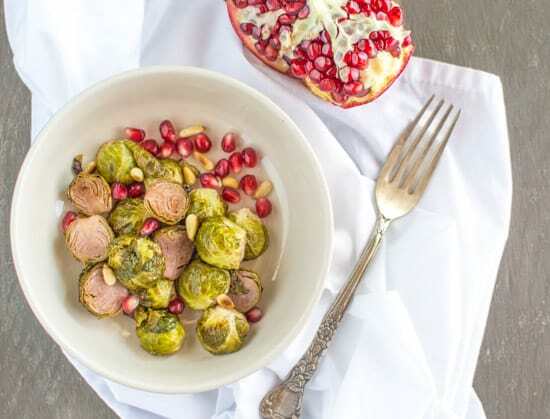 These roasted brussels sprouts have that wonderful tang and sweetness of pomegranates. You’re going to want this for Thanksgiving! Think politics are divisive? Let’s talk brussels sprouts. You either love them (like me) or you hate them (someone who’s not my friend—I kid, I kid). There aren’t too many other foods out there that evoke such vehement opinions from people, though ouzo comes as a close second. I’m not sure where I stand on the ouzo divide. If you’re like me, you have probably attempted to convince brussels sprouts haters to come to their senses to start appreciating this cute vegetable. You’ve roasted them with maple syrup, you’ve added melted cheese, you’ve shredded it all up, you’ve even tossed in some bacon bits. Nothing has worked. For a friendsgiving several years ago, I decided to make some maple glazed brussels sprouts. Of course, one of my friends felt apprehensive towards the dish. He never tried it before, and quite frankly, he didn’t want anything to do with it. But out of respect, he actually tried one half of a sprout! And then, he went back for two more! We struck a compromise, and it was a personal victory for me. Is it me, or have there been a ton of brussels sprouts recipes popping up lately? It’s just like how the food world jumped at pumpkin at the first crack of fall this year. (I’m guilty of this, too.) 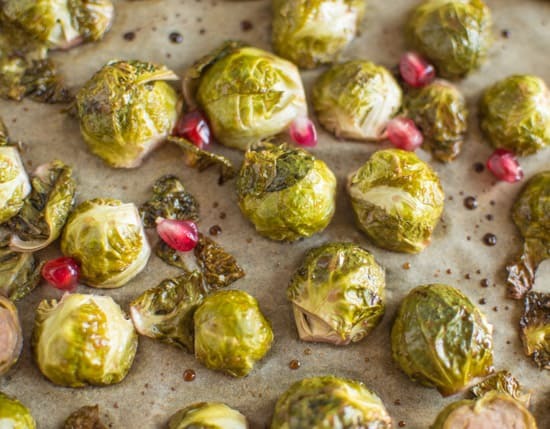 Of course, I think you should try as many as possible because brussels sprouts are fantastic. But why should you give this one a go? Because you’ve spent all that time making pomegranate molasses, and you want to know how it tastes! 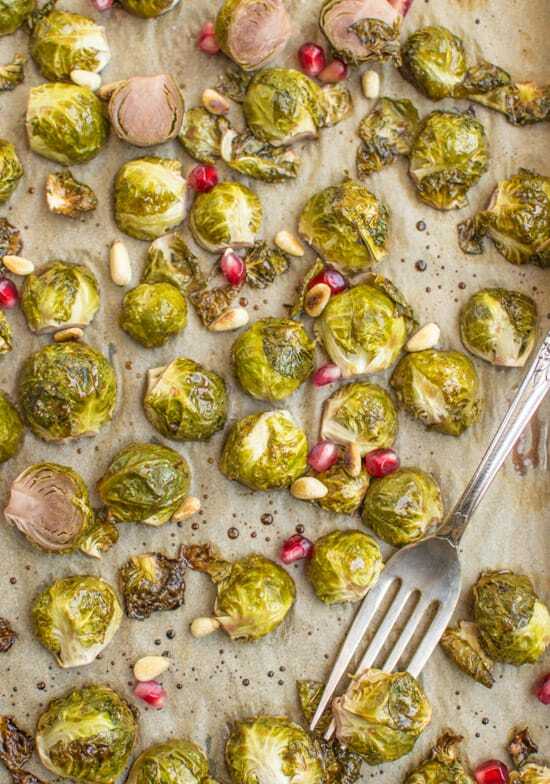 You’ll find that it is similar to maple-glazed brussels sprouts with balsamic vinegar, but the pomegranate molasses gives it an additional tang. These babies are great just on their own, but add some pomegranate seeds and toasted pine nuts for extra pizzazz and presentation. We’re all about presentation points here. Preheat oven to 400 degrees F (205 degrees C). Line a baking sheet with parchment paper. 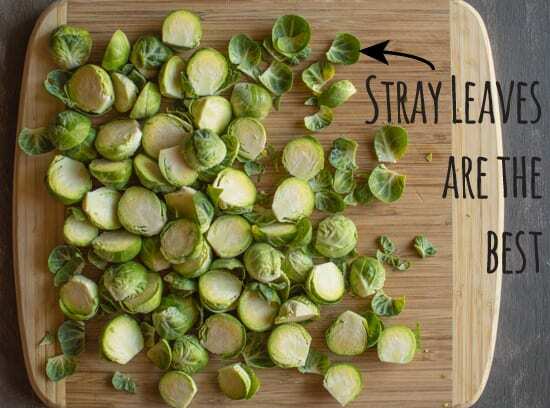 Chop off the bottom part of the brussels sprouts, and chop them in half. 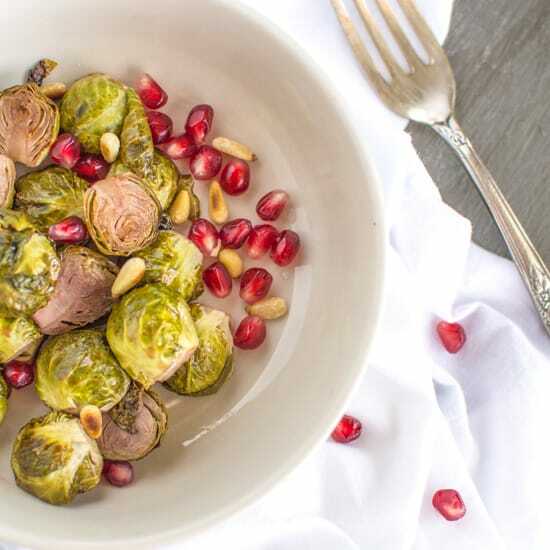 In a medium bowl, mix the brussels sprouts and all the other ingredients together. Bake for about 20 to 25 minutes, or until the brussels sprouts have browned. My brussels sprouts were pretty small, so they were done in 20 minutes. Serve with some fresh pomegranate arils and toasted pine nuts. Best served warm! My family doesn’t like brussels sprouts. They are such weirdos. How can I be related to these people? But they haven’t had them the way I prepare them, so I’m convinced I’m going to convert them this Thanksgiving. Love the pomegranate in here. So festive! My brother hates them too, which I don’t understand because he can handle some bitter Chinese dishes. Let me know if your plan for converting your family works!! Perfect use for that pomegranate molasses! Brussels are so good! The sweetness of the molasses must be divine with them! I wish I could share some with you! I decided long ago that even if I’m the only one in the house to eat Brussels sprouts…I would happily do so! As it turns out 80% of us love them. This recipe looks like a keeper! Thank you! That’s awesome that most of your family likes brussels sprouts! Brussels Sprouts are my favorite part of Fall when it starts getting cold out. I have a bunch of them waiting for me in the kitchen so this recipe is happening! Yay! Let me know how it goes, Pamela! Oh two of my favorites for fall Baby Cabbages and Pomegranates. Great recipe. Roasted Brussels are simply THE BEST. I love them so much. Love the addition of the pom glaze. Delish! pomegranate molasses? I need to find this! It’s seriously some good stuff. Definitely worth trying, Lindsay! I used to be a brussel sprout hater until I had them as an adult and now I’m obsessed. But I’ve never heard of pomegranate molasses and I have to say, the idea is blowing my mind. These sound incredible!! I loved these brussels sprouts! I just wrote a recipe for making your own pomegranate molasses in the previous post. It takes a while, but it’s totally worth trying! I’m with you, girly – the stray leaves are the best! My mom swears by getting rid of the strays, and I’m all nooooooo don’t dooooo that! 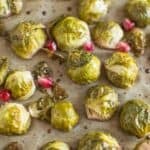 Anyhoo, my family loves brussels sprouts and I could easily see this recipe getting hounded on Thanksgiving! Nooo, she can’t throw those away! Actually, I can totally seeing my mom doing that too! So glad you save them up! I’m a sprouts lover, so you better believe I would devour that entire plate! Hah! That’s funny because I totally finished this whole batch myself! I’m totally a brussels sprouts lover! I am 100% convinced that those haters just haven’t had fresh brussels sprouts before – they’re just turned off by the name or by a bad experience with the frozen kind. If they JUST tried these pomegranate glazed ones, they’d see the light. Also, I want to eat these every night for dinner. Pinned! I’ve been hoarding so many brussels sprouts in my apartment right now! They just look so adorable at the farmers market, and I can never resist the temptation when I’m there. It’s so true, you can’t do frozen brussels sprouts. For me, they have to be fresh and caramelized! I like brussels sprouts when they are roasted! I can’t imagine how do they taste after mixed with pomegranate glaze but the idea sounds so interesting! I’d love to try out! I’m mesmerized by this recipe and those images. Can I have your brain.